A very rare and highly attractive Rolex Oyster Perpetual Chronometer in 18ct Pink Gold from 1954. This Rolex model reference 6567 has the most beautifully elegant, early ’50s Ivory Cream dial and original ‘Leaf’ hands, which pair perfectly with Arrowhead and Pencil hour indices. In terms of purity, beauty and elegance, the absence of a date function is preferred, as this enables the dial to retain its perfect balance. The Rolex Calibre 1030, 25 Jewel Chronometer grade movement is superbly accurate and reliable even by current day standards. The movement has been overhauled and serviced and is in sparkling condition. At 34mm diameter, not including the crown, this is quite a large sized watch by 1950s standards and the watch case has the much more subtle, early fluted bezel. This has to be one of the most exquisite Rolex Oyster Perpetual dials. This beautifully simple and elegant Ivory Cream dial has pink gilt Arrowhead and Pencil hour indices, matched with original restored ‘Leaf’ hands. The Ivory Cream dial contrasts beautifully against the pink gold watch case, hour indices, and hands. Just perfect. This is the original dial which has been restored to the highest standards by our dial restorers which are considered to be the best in the UK. 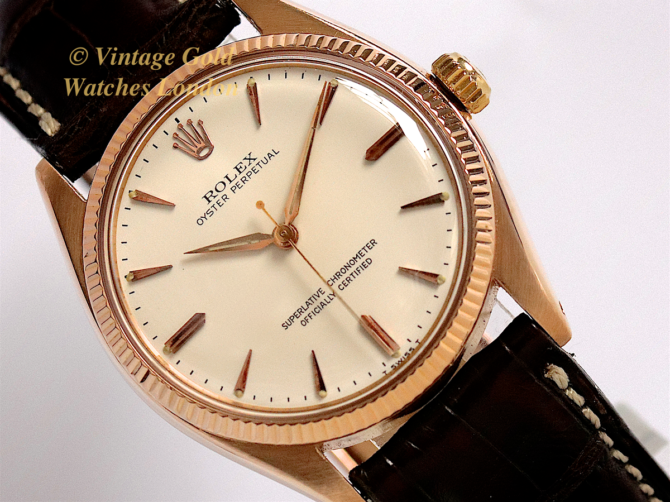 Vintage Pink Gold Rolexes from the 1950s are very rare and highly sought after. Here the original 18ct Pink Gold case is in tip-top condition and measures 34mm, excluding the original Rolex signed Oyster screw-down crown. The case has been professionally cleaned, carefully inspected and lightly hand-polished. It is immaculate with no scratches, dings or other damage, visible to the naked eye. The high polished case-back is of full thickness and has never been engraved. The edges of the case are crisp, and the original 18ct pink gold bezel is sharp, which indicated the case has never been machine polished. Inside the case-back, the markings are all correct and as expected with the Rolex signature; Montres Rolex SA Geneva Switzerland with the Rolex model reference number 6567, along with Geneva Swiss 18ct hallmarks. The model reference is also found on the outside of the case between the lugs, as is the watch case serial number 118908 which confirms the date of manufacture of this watch as 1954. Please note, even though this watch was specified as waterproof when new, and the rubber seals have been replaced on the case-back and crown, the water resistance of this watch has not been tested and is not guaranteed. The original high grade “Officially Certified Chronometer” 25 Jewels, 1030 calibre ‘butterfly’ movement is very highly regarded for being particularly accurate, reliable and strong. This movement is known as a ‘butterfly’ movement, due to the lightened rotor which resembles a butterfly wing. Here, it is in sparkling condition and working perfectly following a thorough overhaul and service by our vintage Rolex specialist watchmaker. This involves dismantling the watch to all its component parts and careful inspection under high magnification, replacement where necessary with only genuine Rolex parts, then careful reassembly and adjustment, before final calibration in 5 positions. The watch therefore, winds, sets and runs accurately and reliably and after final testing and calibration, the movement is running strongly and accurately within +3 seconds/day, which is outstanding for a watch movement of this age! The power reserve of this watch is 42 hours. This watch movement is now ready for many more years of faithful service and is perfectly suited for everyday use. We are therefore very confident in offering this watch with our extendable 12 month warranty on the movement*. The movement is signed Rolex SA Geneva, Twenty Five Jewels, Adjusted to Five Positions and carries the movement reference number 557783 and the Calibre number 1030. This watch is fitted with an original Rolex Brown Crocodile strap with a Rolex pink gold plated buckle. However, if a different style or colour of strap is preferred, please let us know and we will do our best to oblige, free of charge. We carry tan, conker, dark brown burgundy and brown in stock, in plain padded leather, alligator, crocodile skin or lizard skin. Although there are no original papers with this watch, the reference numbers, markings, signatures and hallmarks are all correct, dating the watch to 1954. Detailed particulars will be included with the receipt, along with our 12 months’ warranty*. A separate insurance valuation for the replacement value will be provided at the time of sale and our ‘Lifetime Authenticity Guarantee’ which states: “If this watch proves to be anything less than totally authentic, or not as described, Vintage Gold Watches of London will offer you a full refund at any time”. The watch also comes complete with Rolex Oyster Inner and Outer presentation boxes. This is a truly top class example of a 1954 vintage gold Rolex Oyster Perpetual, in wonderful condition. The watch is ready to wear and totally practical for everyday use. If treated with care it will make an excellent investment or family heirloom piece as well as be something to treasure and enjoy! Even though vintage gold Rolex prices have risen markedly in the past 12 months, we still feel great examples such as this are still undervalued, because as each year goes by, the world market for vintage gold Rolex watches is expanding almost exponentially and so we think prices are destined to climb ever higher in the foreseeable future.